Sorry about being MIA for awhile. First, I wanted to say...Thank you for each and every comment left on my blog for my take of Tim's Tattered Floral Challenge! I'm so thankful for your kindness to stop and leave a comment! Y'all Rock! Once again, on March 23rd, I will post the winner of the Tattered Florals Die and The Steampunked Floral Box. Thank You for playing along! Hey your post popped up while I was on Blogger! Oh Jim I love the new version of the gate. The colors on this page are fun and fantastic! The color palette even got a comment from my dh during your show. He said that I should use those colors-hmmm, I think he was encouraging me to buy some Dylusions . . . Gotta love him! Have a great day. Hugs. LOVE it!!!! The colors are fabulous!!!!!!!!! Love the gates Jim, the "lil" envelopes are really the topper. BTW, I pin these (I gave you your own board!) but the pin link on the page brings up a blank photo so I don't use it. No idea what the tech issue might be but thought you might want to know. What a stunning piece this is.The new gates are fab. and I love the little envelopes popping out. I must get some of those inks to play with. I am not a "painter", but do love ink. The little paint daubers are great too. I like the idea of using metal and paining it.Have you tried alcohol inks?I have some, but don't use them.I'll have to look up some tutorials. Thanks for all you share on your blog. Hey Jim, This is great! So vibrant and spring like. I am wating for my new sprat to ship. Lucky me, I signed up yesterday to take classes with Dyan in April. I just love everything you do. 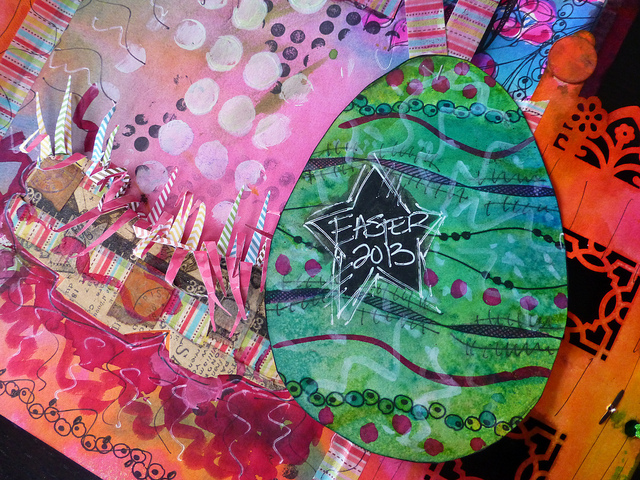 I watched the recording of the Easter page late yesterday and have to say...I LOVE THE NEW GATE! I love everything about it...the little envies, the decorative "holes", the colors, the "hardware", the doodling,and the little ball toppers...so much more YOU than the original. Thanks for sharing the updated version!!! 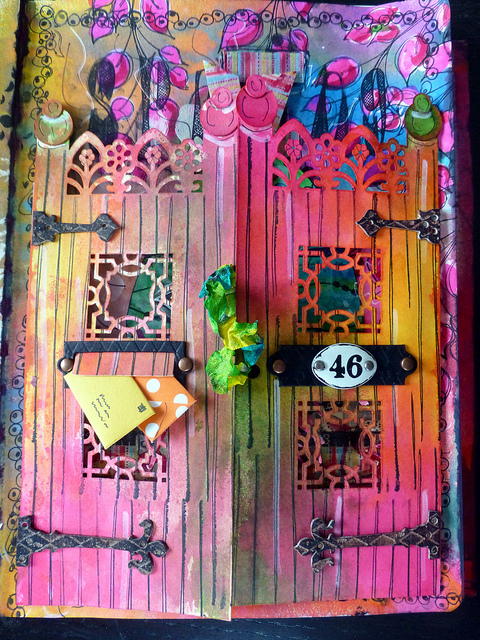 Wow, so much to look at - the gates are terrific, love the mail poking out and fabulous colours! Love the little mail alot with the Easter cards in it!!!! Too cute! Oops that was supposed to be mail SLOT!!! The page turned out awesome! 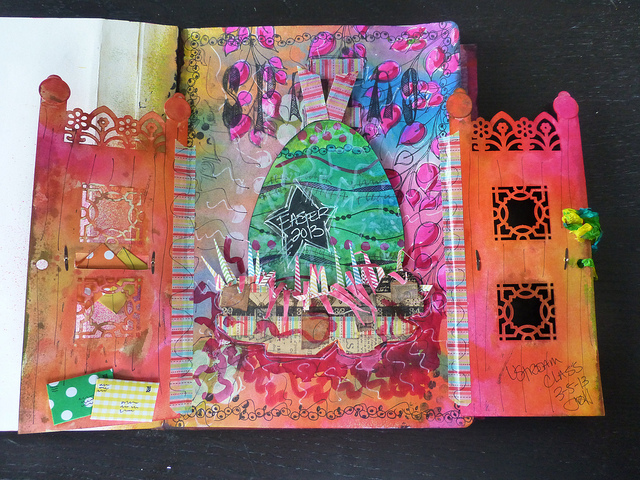 Jim, your journal page turned out FABULOSO!!! I love all the little details, the mail hanging out of those beautiful gates, the house #. WOW! I love it, great job my friend. Absolutely love this. You just keep delighting me with your creations. Just FYI, if I use the pinterest installed pin tool, the pin came through just fine. It is the pin button on the bottom of your blog that comes up blank, not the first time I have run into the problem on your and other blogs. You have your own board on my pinterest page too thanks as always for sharing. The colors are stunning here!!! Your ah-Maz-Ing!!! I love this project, so cool and so many great details. Absolutely Awesome! I love this gate much better! I love watching your Ustream video's to see that you also have a few struggles... I don't know about anyone else; but that sure makes me feel better!!! I also would like to give a shout out to Cesar... Your knitting is way cool! Love to see all of you awesome creations! Okay, back to you Jim... I wanted to take a moment to let you know that you have really inspired me to step outside my comfort zone and work with chipboard! It really helps me to have a project to work on and know that it CAN be done... not just something that I dreamed up in my head! Now for Dylusions... Love them... I just got the new colors and I don't think I will ever get my fingers back to there regular color! I am stained for life! Have a fabulous day!!! Jim, this new gate, in your words, 'ROCKS'. I notice lot's of other touches along the bottom too. I'm sill trying to cut out an egg - how tall is your egg anyway? The finished page is delightful. I hope we can have a Dylusions night on aregular basis. Grief, I just finally found my Dyan stamp plate. Thanks for the pics. I got to watch most of your ustream from Tuesday last night... I just love your video's thank you so much for sharing with all of us in Blogland! 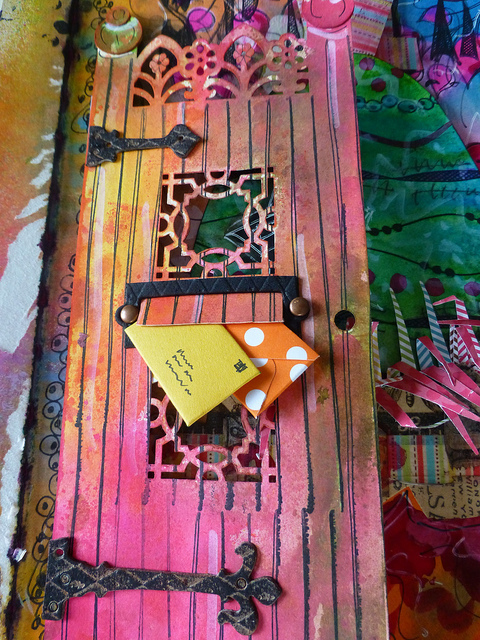 Hope you'll do journal pages again....it was so fun to watch! I love your new gate much more!!!!! I enjoyed your journal and I can't wait to see you do more in it. thanks for all your creativity..
Well, that was something special! An Easter egg surprice! Love it! Wow Jim! Just incredible! Made my gloomy snowy morning a lot brighter! Jim, as I was unable to stay and watch the entire ustream with you last Tuesday, I had no idea where you were going with this project. But, gotta tell you I love the end result. Awesome!!!! I haven't gotten into Dylusions yet, but it is relaxing just watching you play. I love that the projects are always fun, vibrant, and no rhyme or reason to them, just doing and trying. Didn't see the original gates, but these are fabulous. Jim, there are a couple of things that I can always count on you for: fabulous creativity, fun, and lot's of laughs. Thanks for being you, it is always a pleasure to be in your company. Wow! I am really sorry I missed it! I hope the vid is posted so I can watch it soon! COOL! Did you use the WeRMemory Keepers envelope tool to make the envelopes? Does it even make them that small? I am still waiting to find that tool. Hobby Lobby has the Dylusional inks but no stamps. My favorite is the flowers and the pink. Thanks for sharing and have a great weekend! Tis brilliant!!! 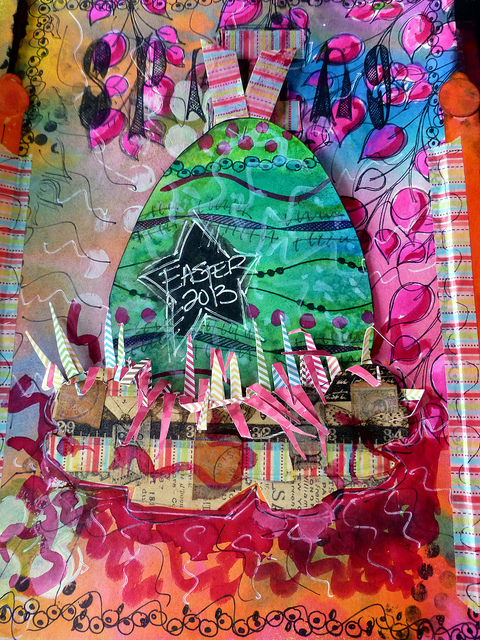 Love the gate, the giant egg, and the mail slot with letters sticking out is FABULOUS!!! LOVE this!!! I love it! !The colors are so vibrant and cheerful !! Had a great time the other night on Ustream!! I am so glad your doing the shows you are so talented! I enjoy every minute of it! Thanks for the creativity and joy that you bring!!! Yet again, I am in awe. That is so beautiful & so clever. Love it hugely.